The hype is here! This is the first preview article for the semi-finals and final of the Summer Tournament happening this Sunday. Make sure to tune in for some university League of Legends. This semi-final sees the favourites for the competition, the Aston Aunties, up against third seeds Strathy. Before the sparks start flying, here are your team profiles. The Aston Aunties were the number one seed going into the tournament and claimed automatic qualification for a place in the semis. In fact they won the regular season tournament in a 3-1 victory over the Cambridge Memers. If this is a match between two big guns, they are the proverbial Big Bertha. Famed mastery spammer and Aston Aunties ADC carry. He is probably best known for his Vayne play, although most recently he has been frequently seen on Ezreal. However, he can pull out some surprises as he showed with a Jhin pick against the UEA Memers two weeks ago going 14/1/15. He is an incredibly proficient AD carry backed up by his trusty support Yellowtail. Matty Triceps is arguably the best Gnar player in the NUEL. He’s no one trick though as he is known to pull out the Gangplank and Rumble, while also saving some surprising pocket picks. Against the UEA Memers two weeks ago the he brought out a Pantheon to great effect after having his trusty Gnar picked away. Recently his ranked games have seen a lot of Fiora. Maybe there’s more to come? The most important player to look out for on this team is J3T, arguably the best jungler in the NUEL. He tore up the regular season finals with Nidalee and was named MVP for the series against Cambridge Memers. He is also extremely proficient on Graves and Kindred (#221 and #52 respectively in the world according to lolskill.net) while his Elise is extremely dangerous. As a result he often draws bans. When his team has needed a tanky frontline he has fallen back on Rek’Sai and Gragas, although both champions still share the characteristic of a strong early presence. He is a tough player to counter having a deep champion pool and on point mechanics. Expect him to take control of the early game and snowball his lanes ferociously. As a team they rely on J3T to put them ahead, either by bullying the other jungler or making his presence known to the enemy laners through aggressive ganking. However, they are all strong players in their own right and are perfectly capable of building their own leads making it one tough team to crack. If Aston take the lead, they won’t let go. 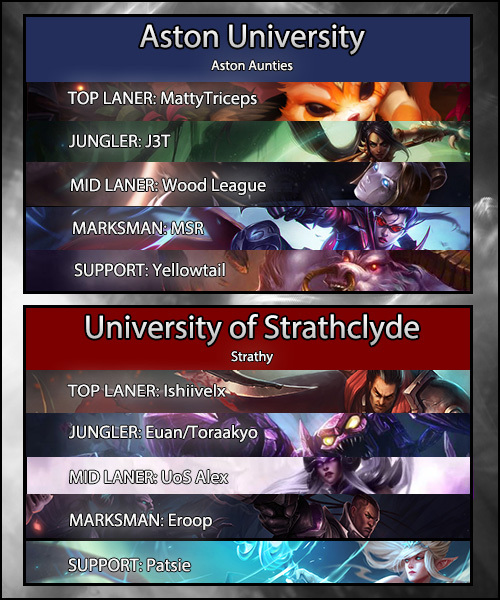 Strathy managed to battle their way through the Gauntlet to reach the semis with only a surprise loss to Droolio and the Gang, their fellow qualifiers. A forty-one minute game against Our Mid Carries Us (University of Exeter) sent them through to the next round. Having finished third at the end of Week 5, they’re up there with the best this tournament. Can they cause an upset? Ishiivelx is a capable top laner, however his champion pool may see some testing. His Illaoi and Darius have seen notable play, but he faces a tough matchup in the form of Matty Triceps who may not be quite as easy to bully. In the team’s last meeting, he struggled in a more team-oriented role on Sion. Expect him to do some damage. Eroop is their AD carry, a strong Lucian player, but he has also seen decent performances on Ezreal and Caitlyn. The metaphorical janitor of the team, look for him to scale up into the later stages for some monstrous cleanups. Euan tends to be their jungler when they need a solid tank in a nearby bush. Yet due to the flexibility of the team’s lineup he is known to play support upon occasion. He is known for his Nunu and Skarner (#223 and #318 in the world, he’s no slouch) and is used to playing a more supportive role than opposition counterpart J3T. With the style of champion he plays, it perhaps portrays a slightly more passive farming and counterganking style. However, against this calibre of opponent his champion pool may be tested, a lacklustre Hecarim performance in the teams’ previous meeting not boding well. Toraakyo is probably their most versatile player, able to plug any gap in the roster. If they want a more aggressive style of jungling, a quick switch does the trick. This was the case last week with their match against Our Mid Carries Us where a switch of roles with Euan meant a Nidalee performance that helped push the team into the semis. However, he can also play top and support if needed. A man for all seasons. Patsie is their star support when playing, keeping his team safe by disengaging fights with crucial bubbles and tornados. He is a strong Janna and Nami player, but is partial to selected aggressive supports such as Leona. Strathy can always rely on him to have their back. UoS Alex is the team’s primary carry in the midlane. A stellar Syndra performance saw his team through to the semi-finals. Meanwhile his Twisted Fate, Orianna and Cassiopeia have also seen play in the NUEL, though the latter slightly less successfully against Droolio and the Gang. Nevertheless, his matchup against the ol’ reliable Wood League could decide how this match goes. That is, if they can withstand the early aggression of J3T. Expect a more passive style from this team out of the base gates, but they won’t be afraid to change it up with a sub always waiting in the wings. A best of three series may suit them.